On May 1, Americans will get to unravel that mystery in the privacy of their own homes. 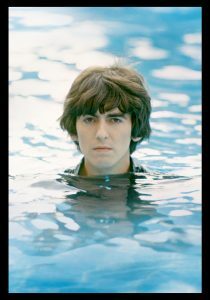 Martin Scorsese’s “George Harrison: Living in the Material World” documentary — which premiered on HBO last October — will be released Tuesday by Universal Music Enterprises in three editions: a 2-DVD set, Blu-ray and a deluxe edition that includes the DVD, Blu-ray, special packaging and a 96-page book of photography to accompany the film — plus the exclusive 10-track CD “Early Takes: Volume 1,” featuring previously unreleased music from George Harrison. The 208-minute documentary traces Harrison’s life from his musical beginnings in Liverpool through his years with the Beatles, his 1971 “Concert for Bangladesh” and his later career as a filmmaker and philanthropist. Most of the material in Scorcese’s film has never been seen or heard before. Others interviewed by Scorcese include four contemporaries who collaborated with Harrison on his Concert for Bangladesh — Ringo Starr, Eric Clapton, Ravi Shankar and Phil Spector — as well as musicians Paul McCartney, Yoko Ono, Tom Petty and Jackie Stewart. Earlier this year, “George Harrison: Living in the Material World” was honored with the Critic’s Choice Award for Best Documentary Feature and shortlisted for the British Academy of Film and Television Arts Award for Best Documentary Film. The DVD is available from Amazon.com for $16.99.